What is Reverse Cycle Air Conditioning and What Are the Advantages? Reverse cycle air conditioners are a great way to regulate your home’s temperature. It allows you to both warm up and cool down your home based on your needs. It is also a very energy efficient option. It works wonders and can help you save money, which are some reasons why it is a must-have addition to your home. Reverse cycle air conditioners are also sometimes called heat pumps. This type of air conditioner uses a refrigeration cycle to cool your home, while the reverse refrigeration cycle helps to warm it up instead. This reverse cycle air conditioning process works by heating your home with the use of a compressor. The compressor pumps refrigerant through the chambers and into a condenser. When the refrigerant is compressed, it starts to warm up and this ends up as the hot air that is blown into your home. After some time, the refrigerant has worked and finished its job. Then, it will flow through an evaporator and start to cool down. It then gets pumped back into the condenser and is recycled. Through the reversal of this cycle, cold air is blown into your home instead, which leaves you cool throughout the warm weather. Reverse cycle air conditioning gives you the full ability to control your climate, allowing you to choose between both cool or warm air. It makes use of the heat that can be extracted from the air outside – even on winter nights – and helps transfer it inside. A refrigerant gas is passed through an external coil, which helps absorb the heat from the air outside. It is then pumped through a compressor into an evaporator inside your home. This process releases the heat into your house. This process is different from electric heaters. Electric heaters directly create heat by using elements that heat up through the use of electric currents. Some examples of ‘direct element’ heaters are portable heaters and panel convectors. Off-peak storage heaters are another example. These heaters are immensely inefficient, since all the electricity utilised to create heat is used to warm up the room. However, reverse cycle air conditioning can transfer up to three or more units of heat for every unit of electricity used. Hence, the running costs of this process can easily be as low as one third of the costs of direct element heaters. Reverse cycle air conditioners are great because they allow you to both cool your house in the summer and heat your house during the winter. By having both heating and cooling functions, it allows you to have full control of the climate inside your home. It is a great substitute for fans and gas heaters. 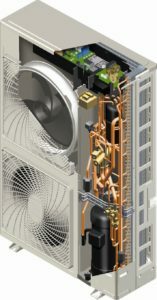 Reverse cycle air conditioners are exceptionally efficient machines, even in extreme temperatures. For every 1 kW of electricity consumed, a reverse cycle air conditioner will generate at least three or more kW of heating or cooling. They can also efficiently recycle air over a dozen times within an hour. This means that you can save a lot of money. You could potentially see a reduction in your power bill by about 30%! This is especially important since electricity prices are ever rising. However, you should still check the energy consumption rates for the air conditioners that you are considering. This is because each of them have different energy ratings. Usually, appliances that have more stars are more energy efficient. Today, many modern reverse cycle air conditioners have thermostats and advanced inverter technology. These allow them to adapt to the temperature and conditions of a room, which in turn helps save energy. The inverter technology helps the unit reach the desired temperature faster. It does this before maintaining it with minimal fluctuations to ensure your comfort. Other than heating and cooling, reverse cycle air conditioners can also help purify the air in your home. It can even help remove any dust or smoke in your house. Many models have built-in air purifying filters that help trap fine airborne particles. They also purify the air that it processes. Some models even have features that help rid your home of odours and can help absorb and kill airborne bacteria and viruses. This can be an important feature, especially if you have asthma, allergies, or any respiratory ailments. This advantage is important since it caters to the health of your family. Reverse cycle air conditioners are energy efficient and this also makes them environmentally friendly. These systems produce only a third of the greenhouse gases that standard electric heaters tend to produce. For the most efficient models, they may even produce less than a fifth of the typical emissions of conventional electric heaters. This is a great option since it is a better choice for the planet, but also for your electric bills – a great double bonus! These models have been created with noise reduction in mind. With technology, manufacturers have minimised operating noises across many different units. This ensures a family’s peace of mind when these machines are in operation. With all the great advantages, reverse cycle air conditioners are a wonderful addition to your home. It has many functions that will not only save you money but will also improve your family’s health. It is also excellent since its energy efficiency helps reduce its carbon footprint as well. Without a doubt, the reverse cycle air conditioner promises many great functions and benefits.